Trainers run a wide spectrum: from the infamous “yeller” (you know, the trainer who is sure to let the whole gym know a training session is going on by shouting motivating cues at peak volume) all the way to the “core whisperer” (the trainer who spends most of the session murmuring tips to an ab-contracting client). The “yeller” tends to leave the client immobile with soreness for a couple days after the first workout. Whereas the “core whisperer” sometimes leaves the client wondering if anything happened at all. As a coach and an athlete, I believe homing in on the middle ground between these two ends of the spectrum sets the ideal path to long-term fitness. But how do we know we are in the “sweet spot” when we are just starting out on a strength training program and we’re on our own? How do we determine an appropriate starting intensity? And how do we know when it’s time to raise our difficulty level? I’ve broken it all down into five steps for you to follow. 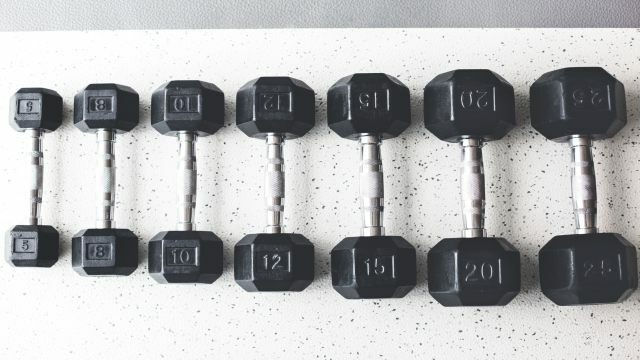 Work through these steps and you’ll discover one of the key strength training basics – how to find the right exercise intensity level to achieve your personal goals. Before you even lift a dumbbell, the question of what success looks like for you is an important one to answer. Deciding what matters most to you will provide a constant endpoint by which you can navigate your strength training journey. There are many options for end results. In fact, this is such an individualized answer that I would not dare to list all the possible responses. It may take some chutzpah (also known as “guts”) to stick to your idea of success and separate it from the ideas of others, but this is key to staying motivated. Don’t get lost in the goal sauce. Your desired result should serve as a measuring stick for your actions – inside and outside the gym. If, for example, you’re seeking to build a long-term habit of exercise, going all out in the gym on day one may feel good in the moment, but may not lead you to your desired result of workout consistency. So, where do you start intensity-wise based on your definition of success? Let’s look at the specifics based on a few different goals you might choose. The majority of your workouts should include 2-4 sets of 8-12 repetitions, which will lead you in the direction of increased size of muscle fibers. Your average resting time between sets should be around 60 seconds. Following a warm-up, the majority of your workouts should include 4-6 sets of 6 repetitions or fewer, with 90 to 120 seconds of rest between sets. This also means you must have access to equipment that will challenge you enough such that six repetitions is the most you can possibly complete of your planned exercises. Your program will be more like 1-3 sets of 15-20 repetitions, with 30-60 seconds rest between exercises, or a circuit-style program with no rest. Then of course there is the hybrid program, where you work on all these things within a week, training for hypertrophy one day, strength the next, and endurance the following. Remarkably, each of these goals can assist one another – for example, if you’re working on strength, it will eventually allow you to lift more weight on endurance and hypertrophic programs. This is also a fun way to incorporate variety and diminish the chances of overtraining. Leave the “yeller” in you at home on day one. If you benched your workout program for a while or are just starting to work out for the first time, today is not the day for a maximal effort. The initial portion of an exercise program is truly about stimulating the connection between your mind and your muscle fibers. Some of the toughest coaches out there, will actually have their athletes and clients lifting with no weight or only a PVC pipe for a month before they begin to increase load. Soreness is great, within reason. You will find that the higher the total number of repetitions you perform, the greater the amount of “delayed onset muscle soreness” you will experience. This soreness typically begins 24-48 hours after your workout and should diminish within 72 hours. Within these timeframes, this soreness is normal; in fact, it is a sign your muscles are strengthening.So, if you haven’t done squats before in your life, it is inadvisable to show up on day one and perform 5 sets of 20 squats. This is likely to leave you in quite a bit of pain from inflammation. A more reasonable first day effort would be to perform a total of 20-30 squats, broken into as many sets as you need to make this attainable. The moral of the story is: if you’re incredible sore, try reducing your overall number of repetitions. A “whisper” style workout may not feel so rewarding or effective, and if you come out of your workout feeling like you have zero inflammation or muscle fatigue, it’s likely you’ve shorted yourself on possible results. If you do not feel any effect from your workout, try increasing the number of repetitions by 5-10 total repetitions per exercise the next time. After your first workout, your body will tell you everything you need to know to decide your next trajectory point. After 48 hours, you will know whether you could have done more, did just enough, or overdid it. Two days after your first effort is also the perfect time to go back for another round of strength training. If your body is suggesting you need to make adjustments to your plan, here are some go-bys for turning the intensity up or down in your workouts. For isometric exercises, like planks, add 5-10 seconds to your time holding the exercise. Try an easier variation of the exercise that involves less body weight. If you need to do more repetitions to reach fatigue, go for the extra repetitions with good form. For isometric exercises, like planks, drop 5-10 seconds from your time holding the exercise. The last 2 repetitions of your final set on every exercise should be challenging to complete. If you do not hit fatigue on your set, try a 10% increase in weight or repetitions the next time you do this exercise in your program. Keep yourself on a clock to work on reducing resting time. Rest is the ghost of all training variables. If you control rest, and begin to cut down rest time, this can have an incredibly valuable impact on your fitness level (and is a sneaky and simple way to ramp up your intensity). 21-15-9 – Pick two to three exercises and complete 21 repetitions of each, then 15, then 9. For example, complete 21 bodyweight squats, 21 push-ups, 21 sit-ups, and then 15 f=if each, and 9 of each. Every Minute on the Minute (EMOM) for 10 minutes– Complete 4-8 repetitions of a given exercise at the top of every minute. For example, complete 4 heavy squats every minute or 6 burpees every minute. Rest during the remaining time before the next minute. Upper/Lower/Core Circuit – A fun way to keep your heart rate up and save time. Rotate between upper, lower, and core exercises without rest. You can also add a spike of intensity by trying new group exercise classes or YouTube classes. Not only will this introduce something new for your body, but it will keep your brain interested, as well. Just remember that when you do something new, it’s a good idea to revisit Step 3 and reflect on how it made your body feel. The strength and confidence a consistent routine can bring is worth every moment of your time and every ounce of your dedication. Learning to gradually ramp exercise intensity lets you control the dial that will guide you to your version of success while also avoiding injury and burnout. Remember, we’re all in this for the long haul, right?